The next time you are traveling in adverse weather conditions consider the fact that many of the traffic signs reporting current conditions on a toll way or freeway are backed up in the event of a loss of utility power, by an uninterruptible power supply (UPS). Not just any UPS, but one that must be able to operate in all weather conditions including freezing weather. Falcon Electric’s SSG Series of Industrial UPSs may not be able to get you home faster, but through their superior design are essential when backing up power sensitive microprocessor based equipment operating in harsh, wide temperature environments. Severe cold weather impacts UPS performance in two ways. First, there is a significant reduction in battery run-time. This is due to the cold temperatures affecting the batteries internal chemistry, increasing the internal battery impedance. The UPS battery capacity must be oversized to compensate. Next, there is the issue of dew point that must be mitigated due to condensation forming on electronics inside the UPS due to normal daily temperature cycles in even moderate cold weather. Falcon’s SSG Industrial UPS, combined with optional 40 Amp-Hour battery banks, can provide the oversizing required for demanding cold temperature applications. Just as important, the batteries used are rated to give reliable, long-life performance in high temperature desert applications as well. The UPS electronics are just as robust, having a UL Listed, -30°C to +65°C operational temperature specification. The option of applying conformal coating on the internal SSG electronics provides the necessary barrier against condensation. Falcon SSG UPS models ensure reliable online backup over the widest temperature conditions. 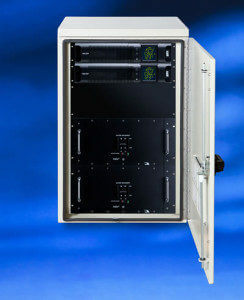 Whether pre-configured inside Falcon turn-key NEMA 3R or 4 system enclosures, or installed in other non- climate controlled, protected locations, Falcon SSG Series UPS products have been designed to operate reliably over a wide range of environments that would render other UPSs non-operational. Falcon SSG UPSs are presently deployed along California and Texas toll roads, east coast bridges, in wastewater facilities, oil and gas fields, and mining applications above the Arctic Circle.